Given the current construction of the Yankees roster, it stands to reason that they need some combination of a first baseman, second baseman, and/or shortstop. Gleyber Torres is penciled in at one of the middle infield slots, to be sure, and Luke Voit and Greg Bird are ostensibly in-line for the at-bats at first – but there is a feeling that at least two of these positions are far from settled. The in-house options may mean that it doesn’t make a terrible amount of sense to spend big at any of those positions (especially with Didi Gregorius slated to return at some point this Summer), but adding a proven talent into the fray is almost certainly a must. Enter the recently freed Derek Dietrich. The 29-year-old Dietrich was drafted by the Tampa Bay Rays in the second round of the 2010 draft, and spent the first three years of his professional career in their organization. He was never regarded as a top-hundred talent, or anything particularly close to that, but he was dealt to the Marlins straight-up for Yunel Escobar after the 2012 season. And, within a couple of months, he made the jump from Double-A to the majors, serving as the Marlins regular second baseman for about a third of the season. Dietrich was an up-and-down guy for a few years, before entrenching himself as a starter in 2016. Some folks reading this might be familiar with Dietrich for his conflict with Tino Martinez back in 2013. The short version of the story is that Dietrich and other young players on the Marlins accused Martinez, the hitting coach, of being physically and verbally aggressive (if not abusive); the end result was Martinez resigning. I will not editorialize this, as there’s simply too much back and forth to draw any reasoned conclusion from. That being said, it’s worth noting that this was well over five years ago at this point, and there have been no further reports of issues with Dietrich’s personality, approach, or maturity. The first thing that jumps out for me is that HBP column – which is why I included it for your viewing pleasure. Dietrich is one of those hitters that crowds the plate and isn’t afraid to take one for the team, which makes those totals a skill, and not a fluke; after all, he has the highest HBP rate of any player with 2,000+ PA in big-league history. And, as a hitter who does not take a ton of walks, those extra free bases help out quite a bit. 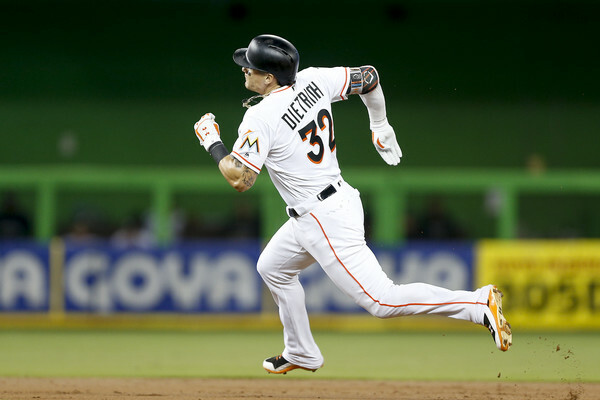 Much like Coors Field can make a middling hitter look like a borderline star, Marlins Park has brought Dietrich’s overall line down quite a bit. And there’s not really a better match for a hitter like Dietrich than Yankee Stadium. It is worth noting that Dietrich has often been used as a platoon bat due to early career struggles against southpaws. As a result of this he’s never accumulated more than 106 PA against same-side pitchers, which makes the sample sizes difficult to draw upon. However, he faced more lefties than ever in 2017, and bested that mark in 2018, and posted a combined 109 wRC+ against them in that time. I’d hazard that he’s at least playable against all but the very best lefties; and, even then, I don’t know that I’d consider him unplayable. That’s not great. Though, it is worth noting that he’s graded out much better at second since the Marlins started bouncing him around, sitting at roughly average over the last three seasons. He’s not an asset at any position, to be sure – but he’s adequate at first and, based on the numbers and the reports, playable at second. Trot him out to third or left at your own risk, though. Dietrich’s injury history is almost exclusively the result of being hit by so many pitches, which is to be expected. The last time he hit the disabled list, however, was back in August of 2016, when he was plunked on the right knee. He’s missed a game or two here or there with assorted bumps and bruises, but he’s otherwise been healthy throughout his career. MLB Trade Rumors projected a salary of $4.8 MM for Dietrich in his second trip through arbitration, and that was too rich for the Marlins tastes. He was designated for assignment on November 20 and made it through waivers unclaimed, which probably means that figure was too rich for every team. It’s possible that a bidding war could start at some point, but any team could have had him for (roughly) that salary plus a year of control in 2020, and every team passed. I imagine that he’ll sign for less. A left-handed hitter with pop that can play two positions of (probable) need that can be had for (probably) less than $5 MM a year sense awfully appealing, doesn’t it? 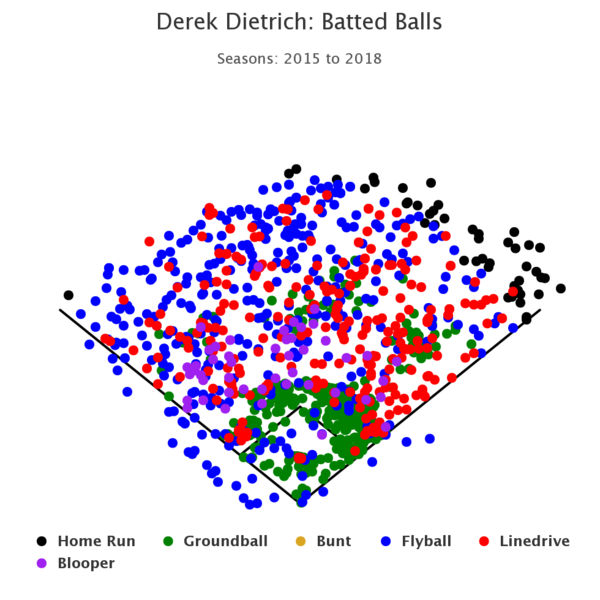 Dietrich is not a star, and he doesn’t offer the same sort of defensive performance of someone like Jed Lowrie or DJ LeMahieu; and he also forces the Yankees to move Torres over to short. Is that really an issue, though? I’m not so sure. The FA market for shortstops is basically Manny Machado and a bunch of glove-first types, so Torres shifting over probably makes the most sense. And given Dietrich’s willingness to move all over the field and come off of the bench, he might just make the most sense for a role that’s likely to change when Gregorius returns to action. The fact that the price is likely going to be right helps, too, as does the potential for his bat to perk up in a park that’s not in Miami. At this juncture, if the plan is to sign a second baseman, I think Dietrich may well be the best free agent option. And I’m more than okay with that.